Standing an impressive 60cm tall, this Sunflower Cottage from wooden toy specialists, Bigjigs, is one of the finest dolls houses we’ve ever seen. Neatly hinged front sections open to reveal four rooms to furnish. These include a living room, kitchen diner, bedroom and bathroom plus a large open-plan attic space. What’s more, there’s a huge selection of 25 pieces of furniture, 2 pet figures and 6 family figures included in the box! Suitable for children of 3 and over, Bigjigs have ensured that this exciting toy is packed full of amazing play value. A selection of stickers is also included with the cottage for complete personalisation. This wooden dolls house is part of a much larger range of Bigjigs products that encompass baby and toddler toys, games, pretend play and even kids’ furniture. Please tell us what you think of the Heritage Playset Sunflower Cottage by Bigjigs. Every little ones dream house! This looks absolutely stunning! 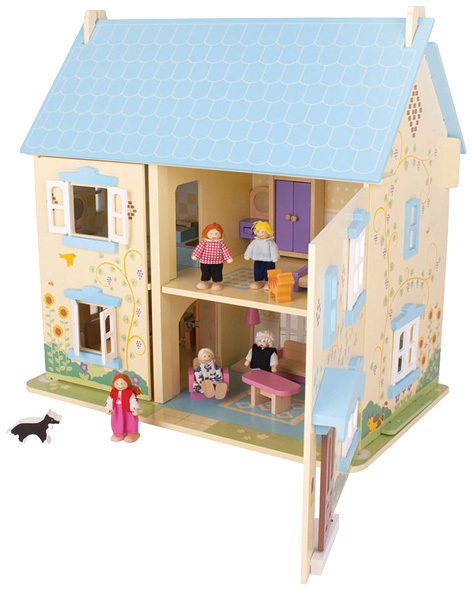 It's the dolls house that all little ones dream about, and comes with so many accessories! Beautiful!